The company's chair gets a pay boost of $70K. Ontario Liberal leader Kathleen Wynne makes an announcement during a campaign stop in Waterloo, Ont., on May 15, 2018. WATERLOO, Ont. — The thorny issue of compensation at Hydro One reared its head on the Ontario election campaign trail Tuesday, with the Liberal premier calling raises for the company's board of directors unacceptable while her rivals slammed the pay hikes as the consequence of the government's privatization of the utility. 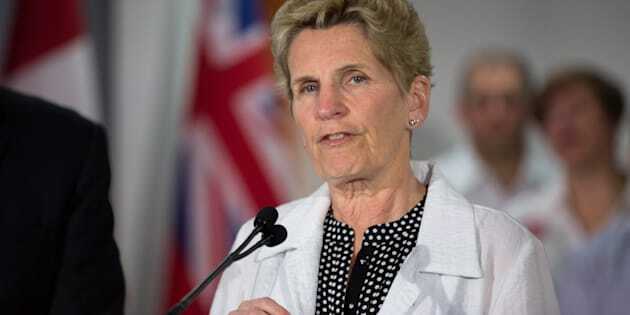 Kathleen Wynne said her Liberals had ordered a review into compensation at Hydro One upon learning of raises for executives and board members, including a $70,000 raise for the chair of the board and $25,000 raises for other board members. The results of that review, she said, are expected to lead to some changes. As a private-sector, publicly traded corporation, Hydro One's compensation policies are determined by its board of directors. Shareholder votes on compensation — such as one the government said it was abstaining from on Tuesday — are considered to be non-binding on the board, although directors often take them into account. Progressive Conservative Leader Doug Ford has repeatedly slammed the Liberals over high executive compensation at Hydro One, dubbing CEO Mayo Schmidt the premier's $6 million-man, a reference to his salary last year. Ford reiterated his promise to fire Hydro One's board of directors and the CEO — who would receive at least $10.7 million in severance — and predicted he'll have no trouble finding replacements. — With files from Colin Perkel and Liam Casey.